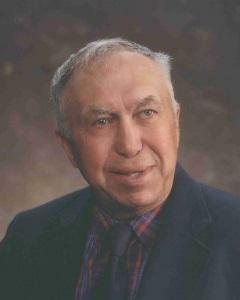 Ralph Novotny, 86, of Hector, passed away Saturday, Jan. 26, at Renville County Hospital in Olivia. Funeral services will be held Saturday, Feb. 9, 11 a.m., at First Evangelical Lutheran Church in Hector, with Rev. Charles K. Stewart officiating. Interment will be in the Hector City Cemetery in the spring. Visitation will be held Friday, Feb. 8, 3 to 5 p.m., at the Hughes-Hantge Funeral Chapel in Hector, and will continue Saturday at First Evangelical Lutheran Church at 10 a.m., for one hour prior to the service. Mr. Novotny’s casket-bearers will be Macius Schroeder, John Melich, Steven Novotny, Mark Novotny, Luke Johnson, and Brad Fosland. Katie Rudeen provided music at the service. Ralph George Novotny was born May 25, 1932, in Willmar, the son of George and Edith (Freberg) Novotny. He was baptized Oct. 23, 1932, at the Church of Hope in Osceola Township. Mr. Novotny was raised on the family farm in Osceola Township, rural Hector. He received his education in country School District 90 and in Hector. Mr. Novotny graduated with the Hector High School Class of 1951. After graduation, he worked in Minneapolis for several years at Armour Meats and also at a job painting hairdryers, all the while commuting home to farm. Ralph was united in marriage to Marietta Rettig at St. Matthew’s Lutheran Church in Penn Township July 3, 1960. He and Marietta made their home on the family farm in Osceola Township, rural Hector. He appreciated Marietta’s help working together in their farming operation with fieldwork and livestock. They raised two daughters, Margaret and Marjorie. Having been a lifelong resident of Osceola Township, Ralph and Marietta moved into Prairie View Assisted Living in Hector in 2015. Mr. Novotny moved into the Renvilla Health Center in Renville in January of 2018. They had shared nearly 58 years of marriage when Marietta passed away in June of 2018. Mr. Novotny was proud to be a farmer his whole life, and was generally active in farm issues. He served on the Renville County Farm Bureau Board, Minnesota Soybean Council, and the National Soybean Growers Association. Mr. Novotny also served with the Renville County Health Services Foundation, Buffalo Creek Watershed, and on the BWSR Board. He served as the District 1 Renville County Commissioner from 2000 to 2012 and represented Renville County as a commissioner on several committees including the health service committee, the Lake Allie Environmental Service District, the Renville County Watershed Managers, the county building committee, the county water planning committee, the Renville County Extension Committee, county housing and Renville County Economic Development Authority, Heartland Community Action Agency, Central Minnesota Jobs and Training Services, CROW (Crow River Organizational Water Board), and the Joint Powers Water Board. He was a member of the First Evangelical Lutheran Church in Hector. Family, family history, and preserving history were important to Mr. Novotny. His many interests included reading, photography, bowling, fishing, threshing shows, flea markets, and touring museums. He belonged to the Minnesota Geological Society. Mr. Novotny was on the board and a very active member of the Renville County Historical Society for decades. He enjoyed many driving vacations across the country, sightseeing, and visiting relatives, as well as the annual family fishing trip. Mr. Novotny is survived by his daughters, Margaret Melich and her husband, David, of Hector, and Marjorie Schroeder and her husband, Dean, of Renville; grandchildren, John (Ashley) Melich of Hector, Valerie (Luke) Johnson of Glencoe, Rachel Schroeder of Lake Park, Iowa, and Macius Schroeder of Renville; sister, Virginia Kiecker and husband, Robert, of Fairfax; brothers-in-law, Clinton Rettig and wife, Marilyn, of Brownton, and Wayne Augustine of Glencoe; nieces, nephews, other relatives, and friends. Mr. Novotny was preceded in death by his parents, George and Edith Novotny; wife, Marietta; parents-in-law, Walter and Helena Rettig; sister, Doris Higgins and husband, Robert; brother, Glenn Novotny and wife Judy; sisters-in-law, Annasonia Rose and husband Ervin, and Janetta Augustine. Arrangements are with the Hughes-Hantge Funeral Chapel in Hector Its Web site is www.hantge.com where an online guestbook is available.